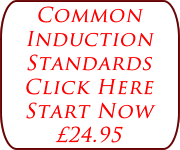 This online common induction standards training course is a requirement for all care staff to undertake prior to starting work, or within the first 12 week period of employment and it will ensure that all staff meet certain criteria before they can safely work unsupervised, as all care managers need to be assured that all staff meet care standards. This common induction standards online training course is conducted using a video based system, with instructor led presentations. Each video can be paused and rewound to gain a better understanding on the course content, before moving on to the next section. Online CPD Certified common induction standards training course for Care Homes, Agencies, Domiciliary Carers. The course fee for this course is £24.95, which includes all downloadable course materials and your certification, which can be printed on completion of this course. You can register and start by clicking the “Start Now” button above. This online common induction standards course for care homes and care staff is CPD certified and is available with 8 hours of CPD credits to count towards your personal development and your evidence statement can be downloaded on completion of the course. Lone Worker Course: This training has been designed to offer managers and employees the rules and regulations that need to be followed when working alone. This online lone worker course is ideal for domiciliary carers, care home and care agency staff who work alone during their working day. The course covers many subjects and will help guide employees who work alone and show them how to deal with any hazard that may arise from limited supervision. Additional information can be found on our Lone Worker page. For additional information regarding this common induction standards online training programme for the care environment we can be contacted on 01206 807552 during office hours, or we can be sent an email through our contact us page.